My character’s name is Mike J Scott. My primary class will be Trooper. My advanced class will be Vanguard. I have watched all of the Star wars Episodes and Clone Wars movies and animations I could get my hands on; which includes Episodes one through six, the Clone Wars volume one and two, and about eighty percent of the new Star Wars Clone Wars TV series. I have read several novels outside of the movies, TV series, and cartoons such as Star Wars Republic Commando Hard Contact, SW Republic Commando Triple Zero, several of the Star Wars Legacy novels, and many more. On top of all that, my dad was and still is a big Star Wars fan and so I’ve been raised liking Star Wars. -Level: Currently (as of 6-10-2011) they are at level 57 and 75% of the way to level 58. -Class: Currently I have a level 10 fighter (Silithia), a level 10 Wizard (Zizivorro), and my main character, a level 17 Cleric (Silvinaer). Silvinaer is a True Reincarnate which means she has went through all 20 levels and is “redoing” them. Her first life was a Rogue and the advanced class she took, also known as, prestige enhancement was Assassin. All of them are in Knights of the Good. -Race: Silithia’s race is Elf and a female. Zizivorro’s race is Drow Elf and a male. Silvinaer’s race is Elf and a female. The role I wish to take in the guild would be something like a Squad Leader, where I have some authority and men under me, but not being the “big dog” such as the Commandant of the Marine Corps where you are the total leader, and no one is above in that branch of service. 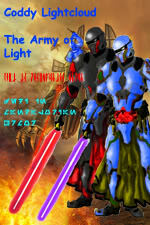 I feel that the Army of Light is a good fit for me because it’s something that I would enjoy and do well in. I like the fact that there are so many dedicated people serving the Army of Light and I would be the next one in line to serve with dedication and loyalty. Also, with being in USMC JROTC (United States Marine Corps Junior Reserve Officer Training Corps), I have learned to serve with dedication, loyalty, courage, knowledge, and other leadership traits and qualities. From what I see, my personality and person would not only let the Army of Light fit me, but that I would also fit the Army of Light. I expect the guild to be active and rise up in the guild rankings to be the number one. Anything else is failure. The people inside the guild have got to be willing to make that happen as well. My age is 16 as of May 23rd, 2011. My time zone is Central time. The only past Role-Play experience I have is with DDO. Unfortunately, the D&D (Dungeons & Dragons) paper and pen is before my time and is rare to find. Some fun expectations I have for a Role-Play game is that it needs to have fun people to be with and play the game with. I also expect things to be as real-like as possible, because I always get the most fun out of it when it’s real-like. I can benefit the guild by getting the job done right then and there. Whether it’s spreading word of something or completing any other task my officer or superiors want or need me to. Talents that I have are “tanking” and flat-out doing DPS (damage per second) in a party, and complying when guild buddies say they need help in a quest or adventure and I have never let someone down when they are in need or of request. I define quality member by how often that member is online, how fast he/she ranks up, how fast he/she levels up, what tasks he/she has accomplished, dependability of the person, the Bearing of that member, and the quality of his/her track record and everything that member has done. The reason I don’t care what they’ve said is because words are nothing if you don’t back them up. I found the Army of Light by scrolling through the long lists of guilds on the SWTOR website and I wanted to be apart of a guild that has many members and seems like they’d be successful. I have visited your website, and very frequently too. I have registered and was given an account in the guild under the name of Mike J Scott, my witnesses to my visits are SSGT (Staff Sergeant) Jando Vek, GySGT (Gunnery Sergeant) Cormac Darjay, PVT (Private) Hyrin, and High General Master Jephos Mispir. I am not sure of which Rules of Conduct you request, but I have read registering terms of agreement and the main thing that I to agree to was maturity, I must always be mature and hold a high standard of maturity. I do pledge to fulfill them most notably. I will hold a high standard of Maturity, Honor, Respect, Personal Ethics and I will make no action of Drama. 14c. The Army of Light wishes to have members who take the concept of Commitment and Loyalty very seriously. By applying and if accepted, you are taking an Oath to both the guild and your guild-mates here. Is this something to which you can commit? I have taken Oath to those concepts and qualities to an organization before and I do take an Oath to the Army of Light of the concepts of Commitment and Loyalty. The qualities of Respect, Honor, Loyalty, and Maturity are not to be played around with. -Respect is how well of a person someone thinks you are and is gained by actions and your Bearing. -Honor is a very similar to Respect, which is a great recognition, great privilege, and is make by uprightness of ones character and integrity. -Loyalty is being faithful to something or someone, even though the circumstances may be great and difficult. -Maturity is being appropriate, respectful, and mindful of what a person says and does. 16. Tell us about a time you offered assistance to someone who did not ask for it but clearly needed it. If you have never had this experience, tell us what you would do if faced with that situation? In my experience, I have been in parties where we have no healer and are trying to get through a quest, but are having a very tough time getting the job done, so I will go and log on as my Cleric (healer), Silvinaer and rejoin that same party to help them out and get through it. I would give the men/women my strategy and battle plan which first, is to get the coordinates of the Sith camp in the clearing, next, go up stealthily to the communications relay and hide from sight, then call in an air strike or some other form of aerial support and have them go to the coordinates of the Sith camp and destroy it and everyone in it. At the same time as the aerial strike, I will take my troops and attack the communications relay. If there is no aerial support, I would look at the sizes, armament, and readouts of the camp and relay. After I review the information, I will decide which is the most dangerous and heavily armed and attack them by splitting into two teams of two. Each team will move to a side of either the camp or the relay (whichever is most dangerous and heavily armed). Once in position, I will give the command and both teams move inward to the enemy and attack, making a sandwich of the enemy and confusing which way they are being attacked from. This makes it a little bit easier to pick off the enemy and destroy them. I am sixteen years old and am going to be a sophomore in high school this coming august. I am taking full command of a company of 9th graders (the number of people is more around a platoon size though) in USMC JROTC. I am trust worthy and can always be depended upon. Last year I received the National Sojourners Medal for being most patriotic and having great American enthusiasm. I am very loyal and patriotic towards what I believe in and don’t like messing around with those two qualities. I would like to rub some of that loyalty and patriotism into the guild and become loyal and “patriotic” to the Army of Light. -Character Physical/Mental Features: He is strong, tough, determined will, a male, and on a path to being a Vanguard Trooper and serve alongside diehard soldiers and Jedi to destroy the Sith. -Character Biography: 29 year old M_J_Scott, who lives on-base with his friends and brother. He goes to the bar occasionally with his buddies and has a good time. Having served a couple of years in the Republic Armed Forces, and when called into duty, he responds with the barrel of his gun towards the enemy of the Republic, ready to cut down the evils in the galaxy with his equipment, strength, moral, courage, honor, and commitment. My user name on swtor.com is M_J_Scott. Thank you for reading my application into the Army of Light. Good app, and good luck. Thanks all and lol Trax. I hope I get accepted too:) cya guys around. Your Application is now Under Review by the Recruitment Council. You will received its decision within 72-96 hours. Good luck Mike, and Ooh Rah!! I'm kind of nervous being a CO though. You'll have to go through NCO school to be granted leadership Mike. By NCO school, do you mean OCS (Officer Canidate School)? Pretty much. If you want a name that better describes it "Officer Basic Training." Mike, please stop posting right after another. It is considered spam, and can get your posts removed. Just a friendly advisory. A really good app, seems well organzied and detailed. Good luck. But I think this application is good enough to be approved. I would be surprised if it isn´t approved.